This recipe originally appeared in my column “Nickle & Dined” for Bust Magazine. Check out Bust for more delicious and affordable recipes! Do you love to spread creamy peanut butter on crisp, sweet apples? This recipe takes that heaven and times it by 10. And just in time for Halloween! Caramel making is an art, one you might not have time to perfect in between doling out candy to the neighborhood ghouls and crafting up your perfect slutty angel costume. This recipe dumbs it down with a secret ingredient: brown rice syrup. Now, it may not be the cheapest ingredient out there – it costs around 6 dollars for a jar – but it pretty much guarantees your caramel will turn out perfect. It also saves you some money at the dentist! The natural sugars in brown rice syrup will be much easier on your pearly whites. Salty roasted peanuts top off the apple, making all your ooey gooey salty and sweet dreams come true. These little caramel apples are so fun and easy you can definitely get kids involved in the process! But don’t get your cats involved, trust me, it will be a disaster. Stick skewers through the bottoms of the apples. Make sure apples are secure. Set aside. Spread a piece of parchment paper over a cutting board. Make room in your fridge for the cutting board, because you’ll be chilling the whole shebang. Stir peanut butter and brown rice syrup together in a small sauce pan. Gently heat over low heat, stirring constantly with a fork, just until smooth and heated through. It should fall from your fork in ribbons. If it seems stiff, turn the heat off immediately and add a little extra brown rice syrup, until it’s fluid again. This happens because different peanut butters have varying amounts of moisture. Use a spoon to spread peanut butter caramel over the entire apple. Sprinkle with peanuts, pressing peanuts into the caramel to make them stick. It’s ok if a few fall off. Place apple upside down on the wax paper and continue with the rest of the apples. Transfer the cutting board with the apples to the fridge. Let set for at least 3 hours. Now apples are ready to eat! I’m gonna make these for my halloween party! Thanks!! Is there a particular brand of peanut butter that you recommend? Very good question! I used Arrowhead Mills http://www.laziestvegans.com/2011/10/arrowhead-mills-creamy-peanut-butter.html I pretty much don’t use any other pb for anything. Awesome! I think I’ll add these to my Halloween party menu. This is great! My kids asked me just yesterday “Mommy why can’t you make caramel apples for us?” with big puppy dog eyes. I feel much better about giving them brown rice syrup than “regular” caramel! Thanks a ton! 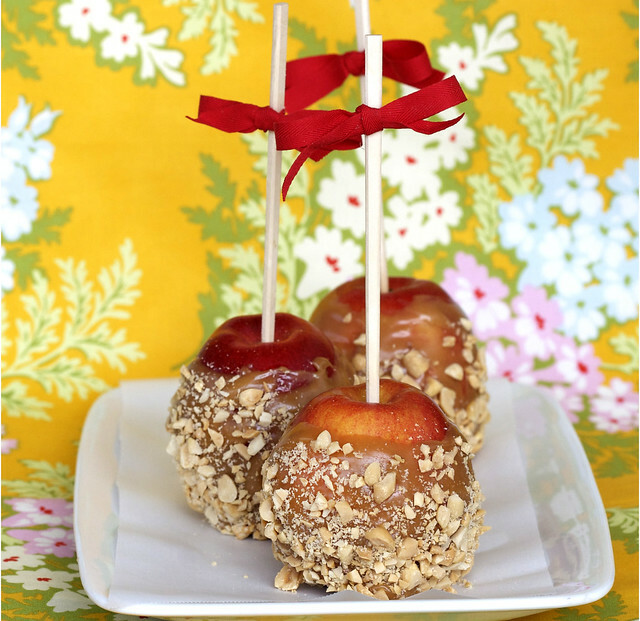 I’m seeing caramel and candied apples everywhere today, and I totally want some. This PB version sounds awesome. Great! Apple + peanut butter = mmmmm!!! I want it, now! can’t find the brown rice syrup………is there anything else???? I NEED to make this! Immediatly! 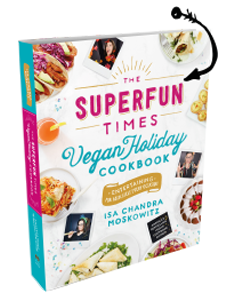 i was just goooogling ‘vegan caramel apples’ so this is perfect timing! Looks great…I might try almond butter instead of peanut butter. I look forward to making it. OMG these look bananas. Putting this on my Halloween recipe round up tomorrow! You saved the day! My kids were asking for caramel apples today, and I was just getting online to find a vegan recipe! Thank you! After reading about it for years, but living overseas in places where it is not to be found, I just bought my first jar of brown rice syrup, so I can make these! My alley, which this recipe is down, has always been paved with peanut butter and caramel. Thank you! Oooh caramel making is so fun, and yes of course I love pb. Please pry this jar out of my hand. These apples are so beautiful that this here vegan is weeping. Made these tonight. Tasty! Just like I remember…thanks again for sharing! Exhibit A of why I always keep brown rice syrup in my pantry. YUMMMM! I am in the UK and have never seen brown rice syrup – can I be a heathen and use golden syrup instead? MissBear you can find brown rice syrup easily in health food stores, Holland and Barrett have it, Wholefoods, even bigger Waitrose. Wooo! Just made these and they are setting up in the fridge while I whip up some “mummy” pizza with cute zucchini wrappings and mushroom eyes! Now to pick the scary b movies and this low key Halloween party is on! P.s. Already tasted the caramel….delicious! I love how it’s sweet enough but not ” i need a cavity filled now ” sweet. The peanut butter/syrup mixture keeps sliding of our apples! Only 1/2 of the apple is remaining covered. 🙁 Any suggestions? Is the pb too oily? Or perhaps more PB needs to be added and the caramel is too liquidy? This caramel should also work well as an apple dip, no? for the mixture that’s sliding off apples, I either put less on the apple to start, or put the mixture just on top and flattened it out (and down the apple) with my hand. Then, quickly smashed in peanuts and got it in the fridge. These are good! They are wrapped up & ribboned in my fridge, but I keep unwrapping them and eating them myself! Wow, thanks for the advice! Mine didn’t slide, so I wasn’t sure what the answer was. i’ve been dreaming of vegan caramel apples! yesssss! I got around to trying this and ran into some of the same problems mentioned. When spreading the mixture onto the apple, it tended to exude oil, which then turned the skin of the apple into an oil slick, resisting the ability of the mix to stick on. I finally patted the stuff on with my hands, and rolled it in the nuts. It looked great, just like the picture. But after chilling, and when trying to eat, as soon as a bite was taken, the caramel mix would slide around the apple, making it impossible to take a bite of the apple. As some of the mix was eaten, the whole covering would fall off (into the bowl underneath, which I needed!). So what gives? Did I cook the mixture too long? These are home-grown apples with no spray or wax (spartan and jonagold), and natural peanut butter (just peanuts). Rice syrup is incredibly sticky stuff, but somehow it bound to the peanut butter, tending to replace the peanut butter oil if pressed, or when contacted with something else. Perhaps heating up the rice syrup separately, then mixing in the peanut butter when off the heat would work better? I bet it has to do with the kind of PB used. I’m truthfully not sure how to remedy that. What brand did you use? Give the apples a quick bath in boiling after (10 seconds per apple) helps take any sheen off the apples and the caramel stick much better. Is there something that can be substituted for the peanut butter? I have a nut allergy. (Rachel) – Can you handle Sesame Tahini? It would probably work well. (Isa) – I used a no-name brand of Peanut Butter that I buy in a pre-packed bulk bucket (4kg). It contains just peanuts and salt. I’ll experiment with the recipe a bit, as I’m sure it has something to do with a heat reaction between the syrup and nut butter. What an easy and great idea for alt. baking! Thank you so much for the idea! Made these with SunButter (and substituted sprinkles for peanuts) for a nut free birthday treat at my sons Preschool. They were awesome!! Just in case anyone was still having this issue, the main reason caramel won’t stick to apples is that most come waxed (very hard to tell). SCRUB your apples in a sinful of water with a tbsp of baking soda and a tbsp of lemon juice. Rinse them and dry completely before dunking. Thanks so much for the tip! I didn’t even think of that. Okay, I scrubbed & dried my apples. Followed the recipe to the “T” (only doubled) the first time because I wanted to try do 10 apples. I followed the directions, and ended up adding more brown rice syrup (about 1/2 c more) because it was still SO thick. It really never did thin down, even with heating (and I did not overheat, just heated it through stirring constantly). I had a hard time spreading it onto apples & getting it to stay on, also, a double batch only coated 7 apples. So, I had only a little brown rice syrup left over and 3 more apples to coat. I took a previous commenter’s (THANK YOU) advice and heated the brown rice syrup first and then added a “dollop” of peanut butter, not wanting to get it to thick again. I tasted it and it was good, so I decided to fly with it. It coated so much better, it was the consistency I expected and was easy to work with- no trouble coming off the apples at all. I put each apple immediately into the fridge to chill and the coating did not come off at all. I am absolutely convinced the heating method is the issue. Every recipe I’ve ever used before that calls for heating ingredients and adding PB, the other ingredients are melted/heated first and then the PB is stirred in at the last minute and I think there’s a good reason for that. That said, thank you for a great recipe- the flavor is wonderful! After a couple more times of making it, I’m sure I’ll get the prep down pat. This is one of my favorite recipes of all time! I’ve shared the recipe sooo many times. Easy and delish! Thanks. Maybe the problem of mixture not sticking to the apples has to do with the pb not being mixed enough in the jar. Be sure to really stir to get the oil and peanuts mixed together then start making this recipie. Vegan MoFo – Wedding Cake | meshell in your city. I made these with Trader Joe’s Organic Creamy Unsalted Peanut Butter, with waxed apples, and substituted agave for the brown rice syrup (did .25 cup + 1 tbsp agave) and the apples turned out great! I was worried when my sauce didn’t fall in “ribbons,” but after adding an extra tbsp of agave to my mixture, I decided to go for it. The process of putting the caramel onto the apple with a spoon wasn’t super easy, but it still worked and I was happy with the end result. I had apples that were quite small, and it the recipe made just enough for 6 of them. It seems easy to make it i definately try it!